A city in Lower Silesia, in the south-western corner of Poland, which used to be part of Germany (called Breslau then) until the end of WWII. It was badly damaged in the war and witnessed an almost complete population exchange at the end of it, but has since been rebuilt and revitalized to become one of contemporary Poland's most vibrant cities. There are only small attractions for the dark tourist in the city itself, but it is also the ideal jumping-off point for excursions to Gross-Rosen. 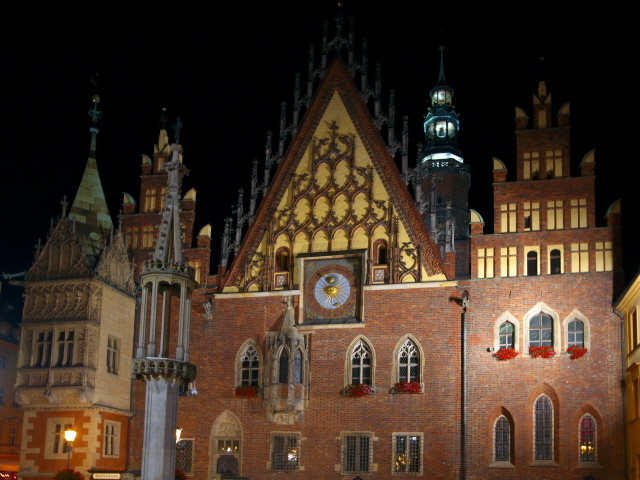 More background info: Also known under its German name Breslau, Wroclaw's history goes back to the 10th century. Over the course of its history it was passed around between Poland, Bohemia, Austria-Hungary and Germany (or Prussia). At the time of the German Empire in the latter part of the 19th century, Breslau was its third largest city (after Berlin and Hamburg). It prospered as a major industrial, military and administrative centre, suffered little in WW1 and quickly recovered, but with the advent of the Nazi era, things started to look much less cheery. Nazism had one of the largest support bases in the city and when the persecution of the Jews gained momentum in the Third Reich from 1938, Breslau was at the forefront. Once home to one of the largest Jewish communities in Germany, this part of its culture was now being brutally eradicated. Almost all of the synagogues were destroyed (see below). Many Jews ended up in concentration camps, including Lower Silesia's own Gross-Rosen and its many sub-camps. Having been far enough from the front lines of WWII, however, Breslau again suffered relatively little as a result of the war initially. Thus it also attracted refugees from other less fortunate places in large numbers. But the front eventually did catch up with Breslau, when from August 1944 the Soviet Red Army was advancing westwards towards it. The Nazi leadership declared the city “Fortress Breslau”, determined to defend it at all costs. And those costs were high, even though Breslau was indeed held longer than even Berlin and only fell on 6 May 1945, after an 82-day siege, just a couple of days before the end of the war. At the end of the war half of the Old Town was in ruins and some of the outer districts had been all but wiped off the map. Many thousands had lost their lives. After the war, the city became part of Poland in the wake of the Potsdam Conference. And with the German population largely gone (dead or moved westwards into post-war Germany), the city, now renamed Wroclaw (pronounced "Vrotswav"), was filled with Polish refugees, displaced primarily from the city of Lwow (which had been absorbed by the Soviet Union as Lvov, and is now known under the Ukrainian name Lviv, while Lemberg had been its name in German). With de-Germanization and Polonization Wroclaw now had a new lease of life and quickly became one of the new communist Poland's major cities. However, when the anti-communist opposition movement gained momentum in Poland in the 1980s (especially in Gdansk – see also Solidarnosc), Wroclaw, too, became a centre of resistance. Things looked up in the 1990s after the fall of communism and the Eastern Bloc. Yet, a natural disaster struck the city in the form of the 1997 floods of the Odra River that inundated about a third of the city. In 2016 Wroclaw was declared European Capital of Culture (together with San Sebastian in Spain). It is currently the fourth largest city in Poland by population (nearly 650,000). As a university city with a student population of over 130,000 (a fifth of the total population! ), the city naturally has a youthful and energetic vibe. And gradually the rest of Europe is getting wind of the charms of this city too, with its pretty looks (at least on a par with Krakow), vibrant cultural life and plenty of top-notch attractions, so that tourist numbers are on the rise too. What there is to see: Plenty, though not quite so much that is of specific interest to the dark tourist (but see under non-dark combinations!). First of all there's the Katyn Memorial. See under Katyn Museum, Warsaw, for the background of what this commemorates. There are many Katyn monuments all over Poland (cf. e.g. Krakow) and elsewhere but none are quite as dramatic as this one in Wroclaw. It consists of blocks of granite of different height. The tallest is topped with a winged angel statue. But it is the sculpture group in the centre that is the really dark one: it depicts a women (mother?) cradling a dead man – the bullet hole in his head made very graphic indeed. Another quite stunning, though more subtle monument is the memorial to the massacres of Tiananmen Square in Beijing, China, in 1989. Almost too easy to overlook on a traffic island it is a smallish square of cobblestones into which the mangled wreck of a bicycle is embedded. Next to this is a smear of red paint on the pavement, symbolizing the bloodshed, and at the front a simple plaque states the monument's historical connection. Not a monument as such, but possibly a place of interest to some dark tourists is Partisan Hill. This oddly-named hillock was actually once part of the original bastions of the former fortifications of Wroclaw, which were taken down during Napoleonic times. Later it was turned into a public space and the current crumbling crescent-shaped colonnades date back to that period. In WWII, underground bunkers beneath the hill became the HQ of the Nazi high command of Breslau. After the war it apparently briefly housed a museum. But now the place is largely abandoned and dilapidated. You can make out a bunker-like structure on the northern side of the hill. Otherwise it's just the air of decay that may appeal to some dark tourists. 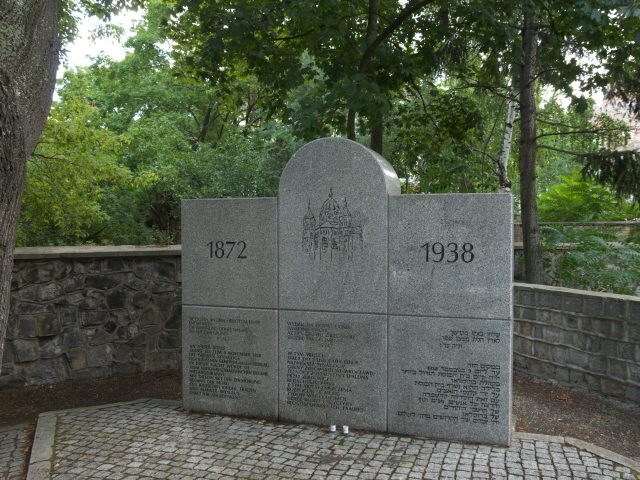 Another dark chapter in Wroclaw's history is more overtly marked by a monument commemorating one of the city's synagogues that was destroyed in the Nazi pogroms of 1938. The location is a little bit hidden, though (see below). A surviving synagogue (now also performing its original function again), on the other hand, can be found right in the city centre, hidden from street view in a pretty courtyard. One of Wroclaw's oddest monuments has to be the one called “The Anonymous Pedestrians” (in Polish: 'Pomnik Anonimowego Przechodnia'). 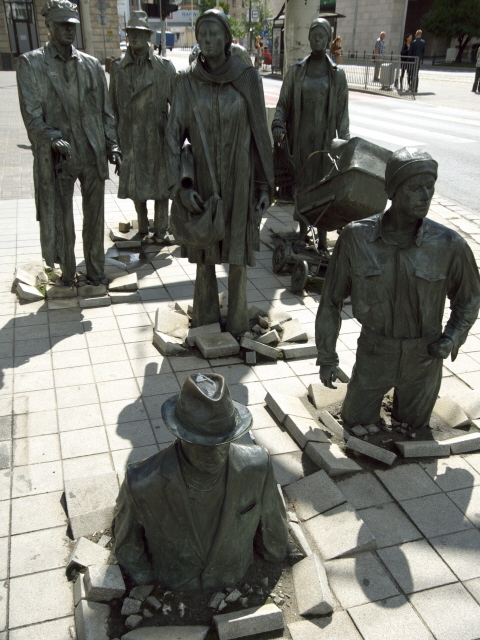 It's a group of life-like and (almost) life-size statues of “ordinary” people, some with bags, one pushing a pram, and some “disappearing” into the pavement. The man with a hat in the front of the group is sunk in to the waist. It's supposed to be a commemoration of the “disappeared” people after martial law was declared in the early 1980s (see Roads to Freedom). There are in fact two groups of sculptures here, either side of Swidnicka Road, on the corner with Pilsudskiego Boulevard. Speaking of odd sculptures: Wroclaw is famous for its richness in this respect. Especially renowned are the many little bronze gnomes you find everywhere in the city centre and beyond. Quite a few are really funny, such as a pair of gambling gnomes, some playing cards, another using a one-armed bandit, that I spotted near the Anonymous Pedestrians. But just keep your eyes open and you'll spot dozens more. Another unexpected, more serious monument I found right on the market square in the very heart of the Old Town is one dedicated to Dietrich Bonhoeffer, the German resistance activist, who was born in Breslau (see also under Flossenbürg and German Resistance Memorial Centre). Much further away, well out of the centre of the city, the very largest Soviet-era monuments can be found, namely at the Soviet military cemetery on the southern outskirts of Wroclaw in the district of Partynice. 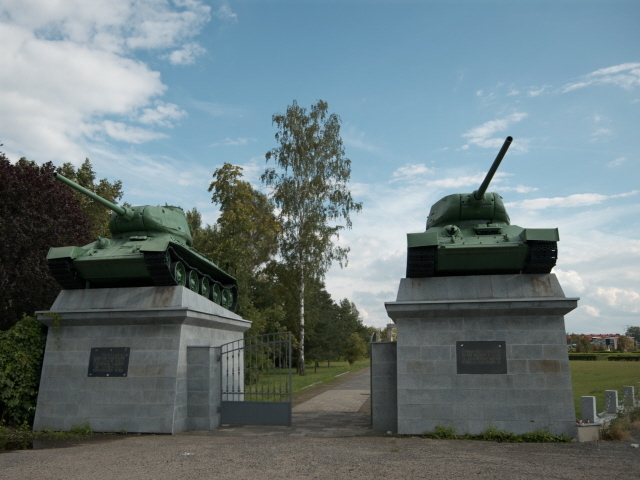 In addition to the usual field of graves, there's a central monument and both the north and south entrances are (in that time-honoured Eastern Bloc tradition) flanked by a pair of T-34 tanks on plinths each, while some lighter guns flank the central entrance. Back in the centre it is also worth looking out for some architectural details, such as the curious skulls on one of the buildings right in the Old Town or the “Renoma” department store just to the south of the Old Town. The latter dates back to 1930 – and all over the outer façade you can see gilded heads poking out that represent the wide world, as it were … in a fashion that is in some cases bordering on the racist, or at least clichéd (especially the depictions of Chinese and black Africans). Finally, there is also a memorial to the latest disaster to hit Wroclaw – the Odra flooding of 1997. It is a statue of a stylized woman carrying a couple of big books on her shoulder (recalling similar scenes actually seen during the flood). You'll find it on a small grassy patch halfway up Most Uniwersytecki bridge. So overall, the dark aspects of Wroclaw are all rather more on the small scale, sometimes even just in hidden details, but still worth seeking out. Location: in the middle of Lower Silesia in the south-western corner of Poland, ca. 190 miles (300 km) south-west from Warsaw and 150 miles (240 km) north-west of Krakow, but only about 50 miles (80 km) north of the border with the Czech Republic and 90m miles (140 km) east of the border with Germany. Details: Getting to Wroclaw is easy, both by rail, road and air. Since 2012 the city's had a newly designed international airport of its own (with some useful connections within Poland and Europe, including some infamous cheapie Irish no-frills airline ones). But it is really not necessary to fly to Wroclaw. It is well connected by railway to other cities within Poland, especially Krakow, Warsaw and Posnan. There are also frequent international trains to Germany (e.g. directly to Berlin) or the Czech Republic. Moreover, the city is also easily reached by car from both east (Krakow) or west (Germany) by a fast motorway (E40), and also relatively good roads north to Lodz and Warsaw. Roads south into the Czech Republic may be a bit slower. If you're thinking of coming to Wroclaw by your own car, make sure you book accommodation that offers parking, as that can be otherwise hard to find. And driving in the city centre really is to be avoided as much as possible. Getting around within Wroclaw is mostly possible on foot – it is indeed a superbly walkable city. I never had to use public transport once, even the slightly longer distance to the Centennial Hall and the zoo can be done on foot and if the weather is good it's a nice stroll. Alternatively both are also easily reached by tram (lines 1, 2, 4, 10). The only sight listed above that is out of pedestrians' reach is the Soviet war cemetery (it would take about an hour from the Old Town, so it is not impossible, but it would not be the most pleasant walk for most of the distance). But again, trams come to the rescue, several lines (2, 4, 6, 7, 17) head down there; the stop to get out at is Przyjazni. Accommodation can easily be found and the choice is good, including several budget options and lower mid-range ones that are of high quality. As usual, opting for a place slightly outside the central tourist hub of the Old Town helps bringing costs down without noticeably jeopardizing convenience (given how easy getting around is). Wroclaw is also a delight in terms of food & drink. Though it can't quite compete with Warsaw on that front, there's still plenty of choice in terms of restaurants, including a few foreign cuisines. 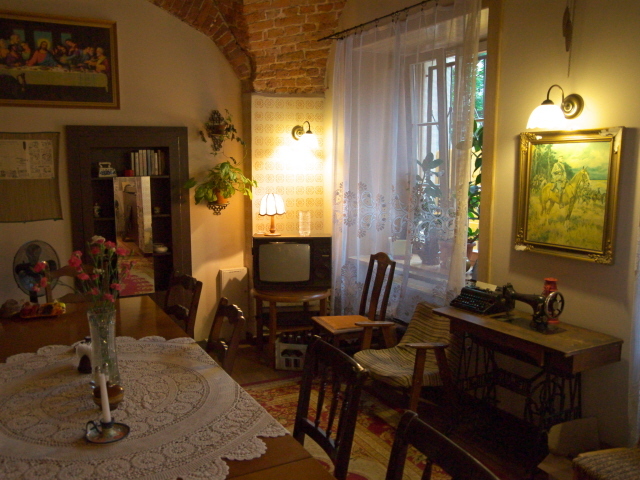 Going for Polish, however, includes some thematically interesting places, such as one called “Konspira”. This not only dishes up hearty traditional fare (and good beers) but also doubles up as a kind of resistance-themed museum, with a ca. 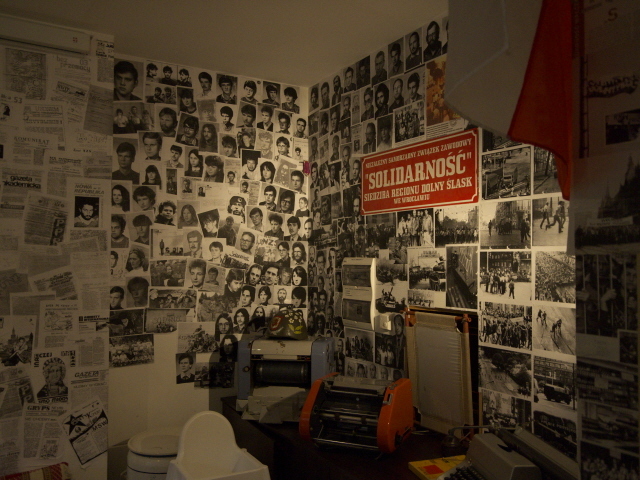 1980 living room and a mock-up underground printing shop and hideout (with the logo of Solidarnosc on the wall). The symbol of the Polish AK is on the wall in the main dining room. Wroclaw's bar scene is as developed as you would expect of such a studenty place, and that also includes a few very good outlets of the recently exploded craft beer trend that is taking many cities in Poland by storm (and this time in a good way, I hasten to add!). Time required: Two days could, at a push, suffice to do all the dark things mentioned in this chapter, but the city deserves at least an extra day. And if you're planning on visiting Gross-Rosen by public transport from here, you'd have to factor in another day (by car only about half a day). Wroclaw is the best base from which to go on a day return excursion to the former concentration camp and memorial of Gross-Rosen. It's easiest to do by (hire) car (you can get good deals from Wroclaw train station), though it can also be done by train (but its a bit complicated and quite time consuming). Further afield, the cities of Krakow and Lodz, even Warsaw, are within fairly easy reach from Wroclaw, as is Bautzen over the border in Germany or (a bit further) Berlin or even Prague in the Czech Republic. Combinations with non-dark destinations: Wroclaw is itself a splendid place to spend a few days in for non-dark things. The main draw, as usual, is the Old Town – and it is deservedly such a big attraction. Reconstruction here has been far more successful than in, say, Warsaw (whose small Old Town feels a bit fake in comparison to Wroclaw's) and it is really very picturesque indeed, especially on and around the main market square, the Rynek, which can easily rival the equivalent in Krakow. But the city also makes superb use of its river (despite the threat of floods). This is the Odra, or (in German) Oder River, and the waterfront along the northern edge of the Old Town is one of the prettiest sides of the city. The best views are to be had from the cluster of little islands to the north-east of the Old Town all interconnected by several little bridges with recreation spaces and open-air bars. To the east of these is Wroclaw's ecclesiastical centre, the so-called Cathedral Island (Ostrow Tumski), which is in fact the very root from which the city grew. It's still an immensely picturesque little quarter, dominated, as you would guess, by religious buildings but also characterized by pretty cobbled streets and lanes. On a more modern note, Wroclaw is also renowned for its large-scale modern wall murals you can see in many places especially in the district just north of the Old Town and the Odra River. Many of these are veritable masterpieces of modern (street) art and worth seeking out (you can get brochures to help with this from the tourist info office). Wroclaw also has more than its fair share of traditional museums, art galleries, theatres and the like – but those more mainstream things cannot really be listed here. One traditional tourist attraction I would like to point out especially, however, is Wroclaw's excellent zoo! I found it one of the best I've seen anywhere in Europe. Especially the new “Afrykarium” complex (incorporating an aquarium, hence the name), is outstanding. But I also liked the bear enclosure, for instance: unlike at so many other zoos, the brown bears here have plenty of space, and it's a proper woodland refuge to play in, even including a little waterfall. The zoo is just south of the Centennial Hall, but can also be reached from the south via a footbridge across the River Odra. With regard to shopping, there are also a couple of highlights to point out. One is the “Renoma” department store / shopping mall already mentioned above. Another is the large market hall on the eastern edge of the Old Town near the riverbank. The large hall with concrete arches may not rival more traditional specimens, such as the one in Budapest, but it is still a delight to look around and inspect the local wares. One rather unusual attraction that Wroclaw boasts is the so-called Hydropolis – an old neo-Gothic brick water tower turned into a high-tech museum featuring all manner of cutting-edge multimedia elements, mostly, but not exclusively on the wider topic of water, but also other sciencey things. Unfortunately I couldn't personally see it, as it was full when I arrived there. To avoid such disappointment or long waiting times you can buy tickets in advance online (hydropolis.pl). One more thing that sets Wroclaw apart from many other cities in Poland (and elsewhere) is that its central train station is actually a top sight itself. Recently renovated it is a stunning palace-like structure with lots of little turrets and big Gothic windows. So even if you do not arrive by train it's worth going there just to take a good look.